If Guy and Madeline on a Park Bench‘s storytelling were up to its filmmaking, it might have been the masterpiece it often seems capable of becoming. Certainly, director Damien Chazelle’s hybrid of classic MGM musicals, mumblecore, John Cassevetes’s Shadows and Jean-Luc Godard’s Masculin Féminin has an aesthetic dexterity that’s frequently breathtaking, its 16mm black-and-white portrait of love and art so nimble and radiant as to stun the senses. Layering Justin Hurwitz’s sprightly orchestral score over views of everyday Boston life, Chazelle’s debut subscribes to a predictable boy-meets-girl, boy-loses-girl, boy-reunites-with-girl template, albeit one that recounts the twentysomething couple’s first attraction, relationship, and breakup in a striking, wordless intro sequence, so that it might focus more squarely on the aimless lovelorn activities of both jazz trumpeter Guy (Jason Palmer) and waitress Madeline (Desiree Garcia) after their courtship’s end. During that bumpy period, Guy shacks up with, and is then abandoned by, Elena (Sandha Khin), while Madeline visits New York, falls for a French crooner (Frank Garvin), and then returns to Beantown to continue working as a waitress, all rather mundane events that are energized, and elevated, by Chazelle’s lushly romantic treatment. Whether with a ravishing silent sequence that finds Guy wooing Elena in a subway car—Chazelle cutting between their eyes, feet and barely touching hands with svelte grace—or an apartment jam session in which the camera whips back and forth from a tap dancer to Guy’s jazz trumpeting in time to the music, the film can be intoxicating. Hurwitz’s old-school music can seem an affected embellishment for Chazelle’s grainy visuals, yet its vibrancy is nonetheless charming. On the other hand, the film’s attempts at conveying emotion through sound and image rather than dialogue reaps uneven dividends: While the intro recap of Guy and Madeline’s affair makes great use out of telling glances and shorthand edits, later sequences, such as Madeline’s trip to New York City, are cursory to the point of glib. Still, there’s an impressive lightness of touch to the proceedings, a delicacy in the way the lens lingers on a stolen look or an offhand street-side sight, that reveals significant empathy not just for the wayward Guy and Madeline but for the city of Boston itself, which, through nonchalant glimpses of its skyline and its inhabitants going about their humdrum routines, is showered with understated affection. Too bad, then, that the film’s dramatic substance isn’t the equal of its style. 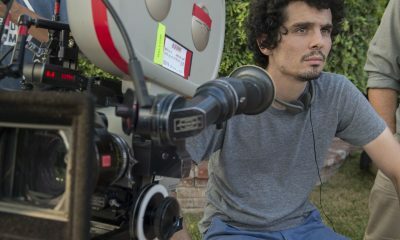 Whereas conventional musicals regularly deepened their archetypal characterizations through expressive song and dance numbers, Chazelle’s protagonists barely exhibit even a single dimension. Revealing the material’s more mumblecore-ish roots, they’re personality- and motivation-free nobodies, featureless slacker mannequins defined only by their indecision and jerkiness, and engaged primarily in figurative thumb twiddling. Such thinness of character and plot ultimately drains any potentially profound pathos or complexity from Guy’s passionate horn-blowing or Madeline’s clunky, amateurish tap-dance routine inside a TGI Fridays-type restaurant. Chazelle’s fleet brushstrokes are initially intriguing but, since his story is incapable (or uninterested) in providing any traces of depth, they ultimately prove emblematic of the superficiality that marks both the duo and their respective plights. While Guy and Madeline on a Park Bench‘s elegance and beauty can be enchanting in the moment, such splendor is undercut by the nagging realization that it’s in the service of a tepid snapshot of happy-go-ditzy ciphers. And thus though the film’s narrative comes full circle at the end, its depiction of art’s capacity for conveying emotional truth remains only a partially realized endeavor.